I recognise the slow, sludgy energy of my resistance to completions coming on. It has been creeping up on me over the past couple of weeks. The more I ignore it the more the power of it’s grimy grip claws into my heart clogging the portals of awe and wonder. There are only twenty two days left to do; I have already done seventy seven entries well over the half way hump, I have navigated training immersions, a malfunctioning phone battery, loosing my phone and being offline. The end is in sight and I am on my knees. I am blinded to awesomeness, I struggle to hitch my heart to the joy of discovery and serendipty. Yes there is stuff going on, chores to do and a preoccupation with my first interview in 3 years on Tuesday but the weight of the resistance is disproportionate. This is the snatching of failure from the jaws of success, the unconscious chaffing of self doubt and unrelenting focus on proving my incapability. Opening to awe is simple. I can do it effortlessly. The minute I surrender the need to know and declutter the now wonder is there; it has a personal flavour, lots of nature and sky, funny combinations of colours and things that tickle my fancy. Mostly they cause me to be wide-eyed and smiling, sometimes sad and contemplative. It is an act of will to drag myself out into the muggy day and up to Little Wormwood Scrubs, in between the fluffy edges of the flocking clouds there was warm, warm sun. 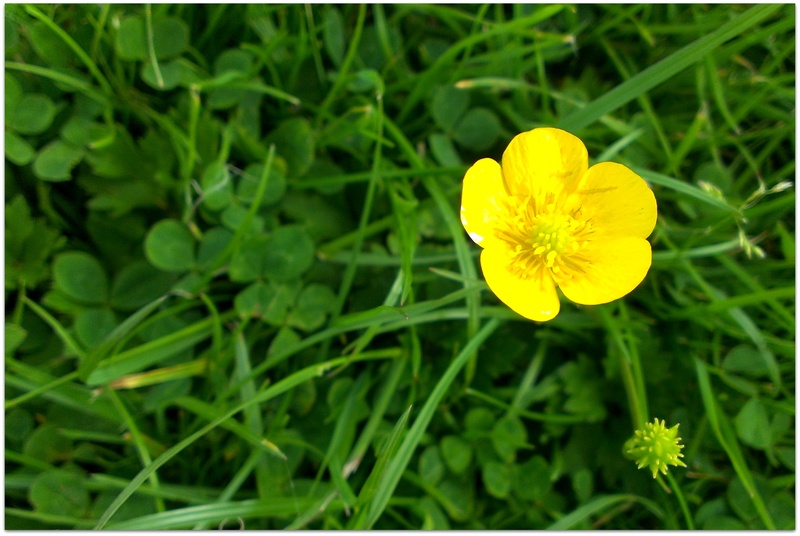 The park is alive and smiling, the green carpet dotted with clover, daisies and buttercups; brighter than brightest yellow buttercups; oh so cute but believe it or not toxic to cattle, horses and other livestock. Who would guess. I linger to soak up the sinking rays.